This Kohler Highline Classic K-3493 is a powerful, pressure assist toilet. It has enough style to look great in any home bathroom and enough flush power to survive in any public restroom. I really like the look of this toilet and its performance is highly rated. If you would like to know if this is the right toilet for your bathroom, then hopefully this Kohler Highline toilet review will answer any questions you may have. Made of Vitreous China material, this durable toilet looks fabulous. It is a two piece toilet with an elongated bowl shape. Two piece toilets are generally cheaper compared to one piece toilets, however, over time they will need some extra cleaning because of extra crevices. Compared to one piece toilets, two piece toilets have a tendency to leak. However, top brands such as Kohler, have solved such leaking issues by improving flushing systems and installation designs. Elongated bowls are more comfortable for larger adults because they are roughly two inches longer than round bowls. Compared to a round bowl an elongated bowl will take up more space, therefore, may not be suitable for very small bathrooms. Of course, the shape and design of your preferred toilet is a personal choice. This model is a comfort height toilet. A comfort height toilet is ADA compliant and suitable for a wider range of adults. It is around two inches taller than a standard height toilet, making it suitable for seniors, the disabled, people recovering from surgery and anyone else that finds it problematic using a short toilet seat. If you have never used a comfort height toilet before, it is similar in height to a kitchen chair. 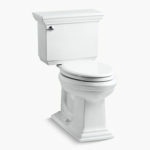 The Kohler Highline Classic is a Comfort Height toilet and ADA compliant, making it suitable for a wide range of people. The bowl also has an Antimicrobial finish that prevent the growth of mold, mildew, stain and odor causing bacteria on its surface. Using the Sloan Flushmate system, the Kohler Highline Classic toilet is pressure assisted, instead of gravity flush system. A Flushmate vessel is used inside the tank. Inside the Flushmate vessel, air is compressed by utilising the water pressure. When the toilet is flushed the compressed air pushes the water out with force. The whole flush cycle from start to full refill depends on the incoming water pressure to your toilet. Minimum static pressure needed is 20 psi and maximum static pressure should be no more than 80 psi. Judging by customer reviews on this flush system, it is excellent. It certainly will not need more than one flush to get the largest of waste down. If there is one complaint, then it would be that the flush can be quite noisy. However, this is common for pressure assisted flush systems. If you want a really powerful flush then it may have to be a little louder. This noise is not continuous though. It is just a sudden loud but brief release of water. The flush is very powerful but not very quiet. Installation should be quick and easy. In fact, the majority of people should be able to install this toilet without any expertise. The only part of installation that may cause issues is lifting and placing the tank and bowl. If you have the strength and your back can take the work load, then I’m sure you will be able to self install this toilet. You will need a wax ring to install this toilet. Also the seat is not included. I found this very detailed replace and install video of this very toilet. This video is very detailed so you can skip through some of it, however it is great to see how easy it is to install a toilet, especially this one. At the end of the video you can see the Kohler Highline Classic toilet in action. This Kohler Highline Classic toilet is a top performer and will be hard to beat. To make things fair I looked for a competing toilet with similar features. A two piece, elongated, ADA compliant, 1.6 GPF and made by an equally respected brand. The toilet I came up with is the TOTO Drake toilet. Now, Toto and Kohler are two of the leading brands in the toilet manufacturing business. They have happy customers that swear by the quality and performance of their toilets. However, is the Highline better than the Drake, which is better value, are they both clog free toilets? Lets have a quick look. As stated earlier, these toilets have similar specs. Both are two piece, elongated toilets. They are also ADA compliant with Comfort/Universal Height seating and both use 1.6 gallons per flush. If they both look great and have similar specifications, then all we have to compare is flush and value. First of all, the TOTO Drake is a gravity assisted toilet. It uses a G-Max flushing system that is not only powerful but it is also quite discreet. 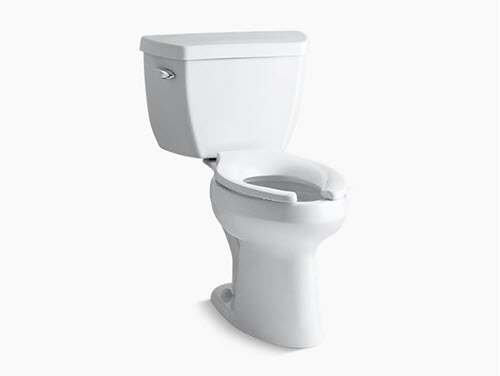 Generally, compared to a pressure assisted toilet a gravity fed flushing system is quieter . The Drake boasts a flush and refill of up to 35 seconds, which is similar to the Highline, depending on the water pressure the toilet is receiving in your bathroom. If I had to bet on more power, then it would probably be the Highline. Generally, pressure assisted toilets have more power, however they are also a little louder compared to gravity fed toilets. However, this extra noise is brief and only happens when the water is being sucked out of the toilet. When it comes to price, both have similar costs and both are very good value. The Kohler Highline is more powerful, however the Toto Drake has a quieter flush. Both of these toilets not only look great but have very similar measurements and features. Either one would be a great choice for your bathroom. Also, both are good value and of similar price. If I had to make a choice on how powerful the flush is, to guarantee a ‘one flush is all you need’ toilet, then I would choose the Kohler Highline Classic. On the other hand, if I wanted an all rounder, good flush with less power but also quieter, then I would choose the TOTO Drake. If you would like to see a full review on the TOTO Drake, then follow the link. The Kohler Highline Classic model combines comfort, looks and power. It is a pressure assisted toilet that guarantees a one flush, clog free, powerful flushing system. If you are looking for a strong flush, clog free toilet , then this unit is definitely worth considering. The Kohler Highline Classic is a great looking toilet, with a top class flushing performance that will clear the largest of waste. It is ADA compliant and very comfortable for most adults. 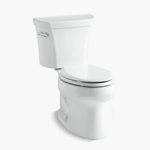 As a pressure assisted toilet it packs a big punch and you can say goodbye to your plunger because it will never clog. Overall, this toilet is a great option. I hope you found this Kohler Highline Toilet Review helpful. If you have already owned one of these toilets, let us know what you think of it. If you have any other questions, please leave a message in the comment section below.